Do you worry about whether or not "God is using you" enough? Are you busy, busy, busy for the Lord? 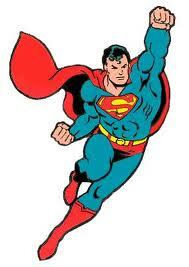 Trying to be a superwoman or superman for Jesus? Or maybe busy, busy, busy just getting prepared? Alan Knox has been talking about trying to prepare yourself to live the superhero Christian life. Doing everything just right, devotions, church meetings, education and training, to earn your supersuit so God can use you. Working hard in your own strength. Turns out that, as Alan says, "God is not waiting for us to find our “super suit.” Instead, he’s waiting for us to begin working to serve others so that he can then work through us." His recommendation: "So, start serving others ... and give God a chance to empower you as well." What? It's that easy? Just start serving, and let God empower you? Wow! Jesus, on the other hand, talks about a man who plants a seed and then goes to sleep and rests. 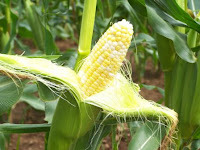 While he is sleeping, corn begins to grow, “first the blade and then the ear, and eventually the full corn appears.” In short, we should not feel that everything is dependent on us when it comes to the work of the Kingdom of God. We should do what we are called to do, but not feel that we have to consume every moment in making things happen for God and for God’s Kingdom. Well! That appeals to me, alright. I could use some rest. How about you? Seems that the Kingdom isn't totally dependant on me, after all. That's a relief! Turns out that even important people like Tony Campolo are allowed to take vacations. Not to mention that it's good to take a moment to enjoy the creation of God, and be grateful for life. She's right, that is a great metaphor. And she goes on to ask herself, "so what’s my square in the kingdom quilt?" She lists things like "helping people through doubt" and "addressing the unique questions my generation is asking" and "finding better, more constructive ways to engage the Bible." I have been going through a planning process of my own in the past days, and I think this question, "What's my square in the kingdom quilt" is something I need to consider. Evans goes on to say that our upbringing, family, culture, and experiences all contribute to our little squares. And that we can take that which we have inherited and turn it into something new, something our own. When I focus on my square, she says, I thrive, and at the same time, "I can relax and enjoy the friendly chatter around the circle as others work diligently on their own." That's an awesome picture. I'm not responsible for the whole quilt. 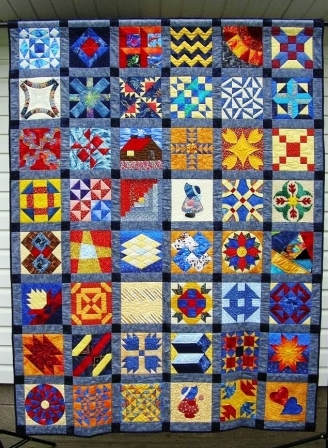 But my little square is still an integral part of the whole (can you picture a quilt with a square missing?). And I'm part of a real community. I've been to enough quilting bees in my past to understand the sense of community quilt-making engenders. Hmmm... What does my square in the kingdom quilt look like? Here's another one of those "struggle" things: this time the "trying to" live in forgiveness; "trying to" transform the way I think. Of course, I can't. All my "trying" fails. I can't earn it. I have to accept it. Christ has done the work; and He is living in me. So stop struggling, trying, earning. Fly in it, and celebrate it! Jon Acuff says it so well in "The bird, the letter, and the job." I pray we will be that bird who does not run, but instead flies. Who looks at what Christ did for us on the cross. The sacrifice, the mercy, the grace and that we will not try to earn it when we return to the farm, but will instead accept it. Fly in it. Celebrate it. And know the joy of forgiveness. What bird? Read the whole story here. If you are anything like me, you've spent at least some time struggling to "build up your faith" at least to mustard-seed level. And you've wondered why those mountains don't move. Here is a blog post that looks at those questions from a perhaps new-to-you angle. You begin to see that there are no limits to what Father has for you because you are now immersed in the ever-growing sense of God’s heart and that’s when it hits you. Jesus was talking about the sense of faith that he was living in with his Father that he would freely make available to them. .... All of the potential of growth is in the tiny wittle seed. But it can’t do it by itself. It needs the dynamic relationship between soil, water, air, and sunshine to grow. But with Father infusing himself into the mix of the relationships it is transformed into something magnificent that branches out and changes the geography of the ground it was planted in. Indeed because it’s not a fixed finite thing, but a growing, ever expanding relationship, what’s to stop it? Wow! Getting to mustard seed faith level, and then getting it to "work" isn't up to me, after all. It's all about Father "infusing himself" into me through our relationship. Read the rest here. At Streams of White Light in Darkened Corners, my friend Gerry asks, "So what does it look like when Jesus' teachings in Matthew 5-7 are lived out in His people?" This is one of those things I have been wondering about a lot. I have seen, in my lifetime, all kinds of attempts to do that - live out Jesus' teachings. I've seen it in church programs. I've seen it in people's personal lives. I've heard endless arguments about it. Those who think that Jesus' teachings are admirable, but impossible. Those who take them as moral guidance. Those who develop programs to teach Jesus teachings, and hopefully demonstrate them, that seem wildly "successful" for a time; so that others flock to be part of them, or try to copy them where they are. Oddly enough, the "living out" examples that have seemed to me to have been most authentic have usually been small groups of believers, and sometimes individuals, just living their lives. Not doing anything special. Not being rich or famous or successful. Just being themselves, often working hard just to make it through another day. Not even "trying" to "be like Jesus." Individuals, yes, but "churches" too. Little groups, sometimes too "small" and "poor" to support a pastor or build a nice building or have any formal programs; often composed of pretty much uneducated, simple folk. And yet, there has been something about them that has caught my attention. Simple kindnesses, acceptance instead of judging, encouragement, gentleness, quick and genuine forgiveness, mercy. Just loving everyone they encounter in a quiet, real way. Daily, helping each other out quietly, watching out for each other and for others too, giving a hand when its needed, and not keeping accounts or expecting anything in return. Not attracting attention or success. And when I have looked at them, and interacted with them, I have been pretty sure that in some way I have met Jesus. But still, I have run around trying to be like Jesus, imitate Jesus, do what would please Jesus, learn more about Jesus so I can "share Him" with others. Running around looking for a group or program or whatever that I can be part of. A "church" that "lives out Jesus' teachings." I guess I have looked to see what they are "doing." Even though those I have really seen Jesus in, just seem to have been "being." I was really excited when I encountered Pastor Peter and the little gathering of the church on the streets of our community. I wanted to be part of something like that. I could see good things happening, people being "changed." I could see Jesus' teachings being lived out. I suppose I thought that it was all about what Peter, and the others, were "doing." I wanted to "do it" with them. And yes, I have "helped out" and all. But I found myself often feeling discouraged because I was not comfortable trying to do the things Pastor Peter does, the way he does them. Others I know have felt the same way; and yes, they - and I too - have sometimes tried to change things to "our way" of doing. But Peter keeps repeating, "I'm glad to have you here with us. We can do this together. But you have to be who God wants you to be. And you have to let me be who God wants me to be." I am not Pastor Peter. I am not a big tatooed guy who used to deal drugs and be a bouncer at bars and drive a Harley. I'm not trained in nursing like he is. I'm not comfortable wandering back alleys by myself. He keeps telling those who want to help, that they need to be who God made them to be. And that if they want to be part of the "Another Chance Street Ministry" it must be because that is where God plants them, and it's only really possible with Jesus living in and through them, who and as they are. And that's going to look different with every one of us, but if we are allowing Jesus to be who He is, the head of His body, and accept ourselves as who He has made us, then all our differences are going to come together. We don't need to compete, nor do we need to try and fit in and do what others are doing or what others want us to do. And the "street ministry" isn't any better or more useful or more "living out the teachings of Jesus" than what others in the whole group of believers that make up "the church at Penticton" are doing. We are all needed. We all need to let Jesus live out his life in each of us. He does the "coordinating." He IS the coordination, the center, the purpose, the way, the Life. Slowly I am learning to stop trying. Slowly I am getting past "knowing about Jesus" and "doing things for Him." And instead, I am coming to "know Jesus" in relationship with Him and His body, His church; and to simply be who I am, the me He intended from the start, with Him living His life in and through me, through us. What does it look like? I'm beginning to think that it looks like more different things than we can imagine. Jesus living out his life in and through every believer, individually and corporately in his body... that is bound to be as creative as he, the Source of Life, is. I have been getting more and more disillusioned trying to "be like" Jesus, or even "be like" others who have been held up (and admired) as the hands and face of Jesus. And so they may be, but they are each of them only, I'm thinking, one small aspect. We say we want others to see Jesus living in and through us ... but then we look around to see how that is working out in others, and try to copy that, instead of just letting Jesus do that, his way, in us. If Jesus is to be seen by the world as he is, then he is going to use each of us, individually and corporately, to show various aspects or facets of him. Yes, if we are really allowing him to live his life in and through us, we will demontrate his love and mercy (and share in his suffering too) ... but how that "looks" will be amazingly varied and creative. And not to be "judged" by others as better or worse or whatever! We should be rejoicing in how Jesus lives out his life in others, whatever that looks like, and also joyfully accept and eagerly participate in the way he chooses to live out his life in ourselves (individually, and living his life out with the others where he places us) as we are in relationship with him, without comparing to others. (Not to mention that it sure relieves me of pressure to perform, or to live up to others expectations, or to try to do things to please him, etc). It's not a contest. It's not a life of imitation. It's not a plan or a goal that can be reached through a series of steps and actions. It's just "Christ in us." Jesus living His life, Father's life, in and through us, his children, his church, his people. And others seeing that life, seeing Him. I've been seeking Jesus. To know Him, not to just know about Him. As I have said before, in my childhood I somehow got the impression that to be a Christian is to "accept Jesus into your heart," and to memorize and be able to spout (or at best pass on to others) a list of facts about God, and live a moral life "like Jesus." A rational theology, for the most part, accompanied with a hazy concept of "faith" which itself is supposedly based on the "fact" of God, but kind of mysterious and hard to attain (though it could sometimes be "worked up" with a certain amount of emotionalism). I liked the rational part; it suited my way of thinking. I was nervous about the mystery and emotional part most of the time, and anyway, we have the Bible so we no longer "see through a glass darkly" if we just know the facts, right? To be honest, I starting doubting all that pretty quickly, even as a child, but it sure was buried deeply in my thinking from an early age, and has kept hounding me. So maybe I need to open myself to the "mystery" a bit more. After all, Paul wrote about it. And said that the mystery of God is Christ, and the mystery of Christ is the church. There's no doubt that the more facts I have stored away, the more mysterious Christ and the church have become to me. But why would God use mystery? How can truth and mystery be reconciled? It doesn't seem rational. That sure explains a lot. So I don't need to rationalize, know all there is to know about God. I can't. Even Moses only got to see God's back in passing. So all those rational systems so many of us have been depending upon are, in the end, too small. And it is okay, after all, to have questions about them. In fact, I'm pretty sure that a lot of the questions I've had have come from the Spirit of Christ (though somewhere along the line early on, I was told that questioning comes from the enemy. So don't question. Hmmm). Of course if my questions arise out of my own "self" and "the world" - and yes, the "enemy" - I'll most likely just end up substituting a new system of my own making. Wow. So I really do need Christ in me. Oh, right. There's that relationship thing. That marriage analogy. The "Bride of Christ" picture the New Testament keeps coming back to. In their zeal for theological purity and social relevance, they lost their "first love" - the sovereign Christ and the supremacy of loving Him. Oh! Knowing and loving Jesus. Not just "getting it." But "getting, knowing Him." So now what? At the same time as I've been going through this growing-to-be-in-relationship-and-to-know-Jesus space in my life recently, I've also been going through a stage of wondering where "I" as an individual stand in all this, how all this impacts my life on a practical basis. Do I just carry on with my life, maybe even dream and plan and act on my hopes and goals, or do I just sit and wait till somehow I suddenly "see clearly God's will for the next step"? Or maybe some kind of combination of both? For awhile, I was just sitting, feeling lost. Lately I got to the point where I decided to get busy and go ahead and do something - but at the same time be willing to let the Spirit guide me elsewhere as He desires. After all, scripture says we are to work, support ourselves, help others. Not just sit around waiting. But still, this nagging feeling that maybe my dreams, plans, goals are really "about me" after all. The sun has been rising a bit above the mountain top, after a long, slow dawn, on that issue, too. You can check out my thoughts on that over here. Thank You, Jesus, for Your light. Thank You that You are THE light. Awesome article. http://subversive1.blogspot.com/2011/03/nobody-follows-jesus-so-why-should-you.html. Go read it. You might want to sit down.